Overcast with rain showers at times. High 57F. Winds SW at 5 to 10 mph. Chance of rain 40%..
Allison Fisher and Dane Stanfield were united in marriage on Dec. 31, 2016, at Church of the Assumption in Bellingham, with Reverend Scott Connolly officiating. A reception followed at the Bellwether Hotel. The bride is a daughter of Scott Fisher and Laura Hadwiger, both of Bellingham. Perry and Megan Stanfield of Lynden are the parents of the groom. Serving as maids of honor were Katie Klein and Alexandra Forsyth. The bridesmaids were Sarah Dykstra, Katie Adams, Christina Stanfield, Taia Wu and Savannah Mora. Serving as best men were Dylan Stanfield and Gavin Grisham. The groomsmen were Thomas Witecki, Andrew Colebrook, Joshua Russell, Nicholas Solimano and Galager Martinez. Calvin Carper served as the ringbearer. The bride is a graduate of Sehome High School and the University of Washington. She has a bachelor’s degree in computer science and is employed as a software engineer for Google in Los Angeles. 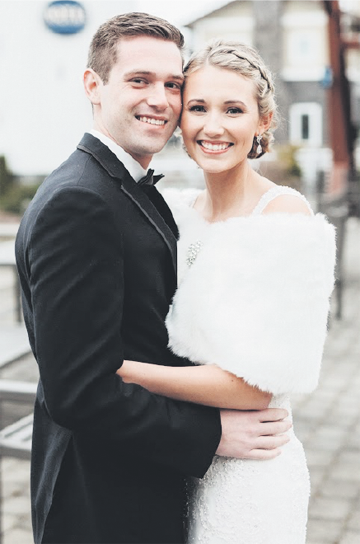 The groom graduated from Lynden High School and Western Washington University with a bachelor’s degree in chemistry. He is attending graduate school at UCLA while pursuing a PhD in materials and nanoscience chemistry. After a wedding trip to Kauai, Hawaii, the couple is living in Los Angeles.